Voice in their own words Teenagers predict the Future is a bi-lingual English Japanese book that documents the visionary predictions of 16-18 year olds from around the world. Lisa Morgan ran Future Seeing workshops with teenagers across Asia and in the UK from 1998 to 2001. In total, 132 young people of 13 nationalities took part in The 17s Project. The drawings and descriptions of their future expectations are juxtaposed with portraits of the teenagers by photographer, Caroline Parsons. 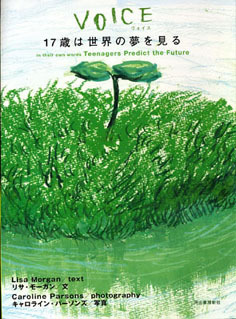 Voice was published by Japanese publisher, Kawade Shobo Shinsha and also in Taiwan. If you would like to buy VOICE in their own words, teenagers predict the future, it is available in Japan from booksellers, and, in the UK, only from Future Seeing Ltd at 10 pounds plus postage and packing. Please contact to order. This study was also made into a short documentary: Voices of the Future. Also in preparation, Creative Hypnosis (working title) - a guide to using trance for breakthrough creativity. Are you looking for your personal or business consultancy?